The imposing walls of the Red Fort in Delhi stretch over two kilometers. 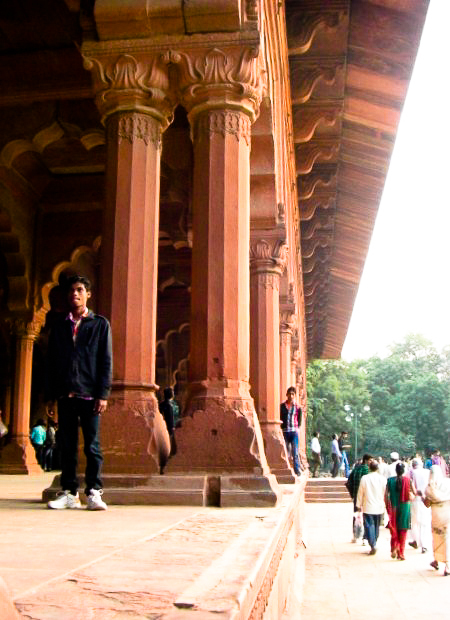 They were built by Shah Jahan, who, like his grandfather Humayan, preferred Delhi to Agra. The fort was a huge undertaking. The builders and architects were told to create a paradise on earth for the emperor and his court next to the Yamuna river. At the edge of the private royal residence was the Diwan-i-Aam, where the public came to the ruler to tell him their problems. There was a courtyard and garden in front where the people used to gather to see the emperor sit on his magnificent throne. The area was heavily ornamented and hung with thick curtains--meant to impress and awe all those who saw it. In the private quarters, a continuous channel of water connects a row of pavilions. 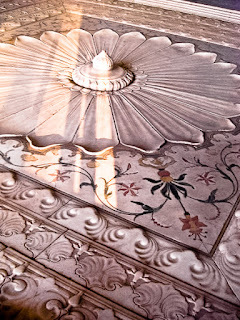 The Nahr-i-Behisht, or "Stream of Paradise", collected in pools (like this one in the Rang Mahal) and fountains throughout the royal gardens and provided a kind of air-conditioning for the summer months. 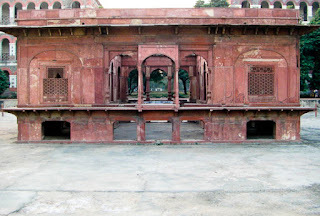 One of the last things to be constructed by the Mughal rulers within the fort is the pavilion in the Hayat baksh garden. 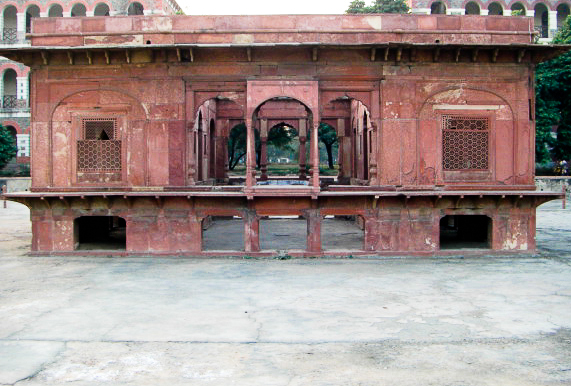 Here Bahadur Shah II built his own small palace within a lake. 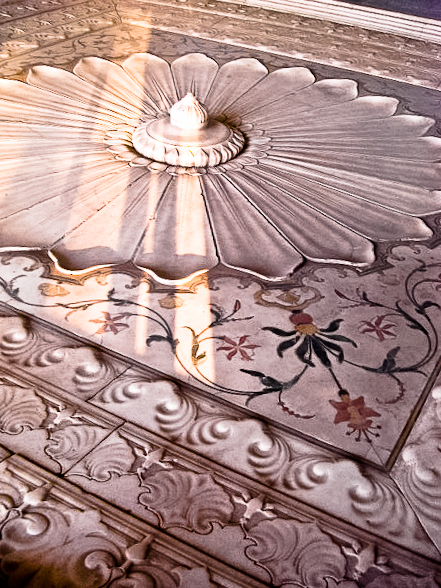 The descendents of Shah Jahan found it difficult to maintain the splendor of the fort. And not just building at the same level of grandeur, but living. When the British took over the fort in 1857, the royal descendents were found living in run down streets and alleyways that looked the same as those outside the fort. The whole area was cleared away for army barracks. 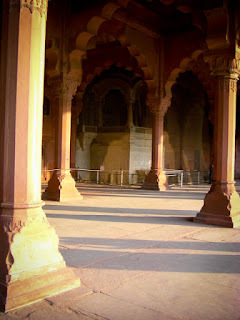 Now, the red sandstone columns of the Diwan-i-Am glow in the afternoon sun, but in their original state, painted gold, they must have awed the public audience that gathered here to see the emperor. 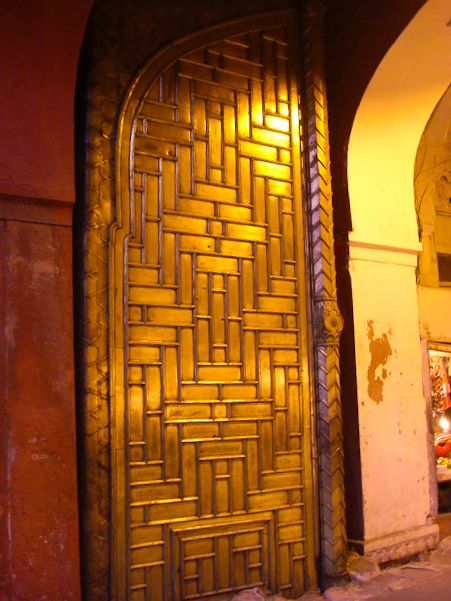 The golden door is the entrance to Chhatta chowk, which was modeled after the Persian covered markets. 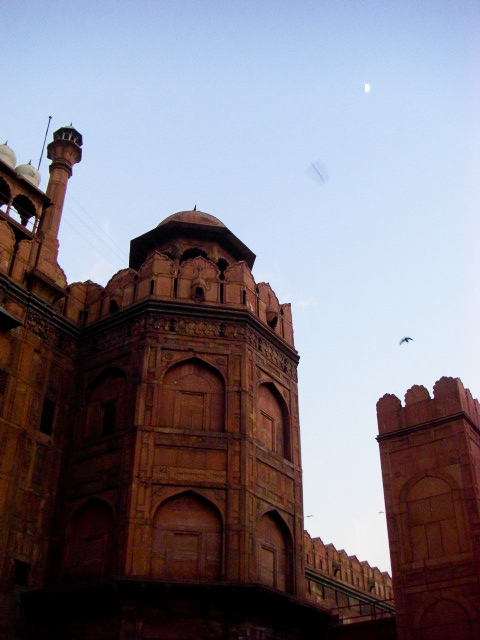 Shah Jahan thought the covered market was a good idea as a relief from the hot sun. It's still a market place for the usual touristy items of India. Mughal and British rule have both come to an end in India. 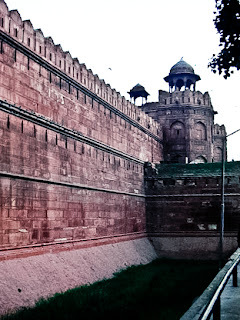 The towering red walls of the Red Fort symbolize the independence of India and the merging of history with the present.